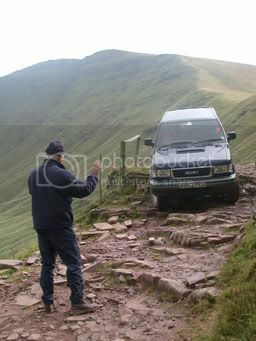 We just got back from two days of off road adventure in Wales with All Terrain Services. We left early Monday morning and zipped down the M4 to Pontardawe near Swansea and met David who was our instructor over the next two days. After a short briefing of the schedule and a bit of theory of how a 4x4 works, we soon hit the road in an Isuzu Trooper. We stayed that night in an Inn which I can't tell you the name of. Welsh names are too hard to remember and you certainly won't remember their spelling! The room was disappointing: cheap and cheerful but at least it was clean. The bartender and owner of the place was very friendly and jovial though. Food was good so that helped our mood tremendously. 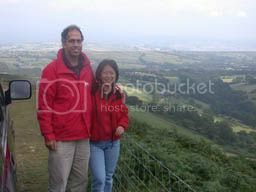 The next morning, after a full English/Welsh breakfast, David picked us up and we headed out for a cross-country drive. We followed an old Roman road from near Merthyr Tydfil to Brecon in Brecon Beacons National Park. It certainly got us out into the middle of nowhere although it didn't get us away from the sheep. Sheep are everywhere in Wales! Jenny had a challenging time with a steep descent and ascent she had to get us through but she made it on the second attempt. We stopped for tea on a mountain pass with a fantastic view. I got us down the rocky track on other side and we made it to a nice pub for lunch. In the afternoon we traversed two more rough tracks across Welsh mountains. It's a slow and bumpy process but we never got in any trouble. Because there was no other vehicle with us, David couldn't take us anywhere too risky because there would be no help at hand. Mobile phones don't work where we were either. There was lots of great scenery along the way and we were always kept company by herds of sheep. The weather wasn't great with a bit of rain and low cloud mist at times but it cleared by the end of the day for some great final views. So getting out in a 4x4 was pretty fun and Jenny seemed to enjoy it. You can certainly get to places that you would otherwise be unlikely to see. We learned a lot from David about off road clubs, competitions and places you can go. It all sounds like quite a fun scene. I particularly like the idea of going off road in France.